It’s been brewing for quite awhile now. 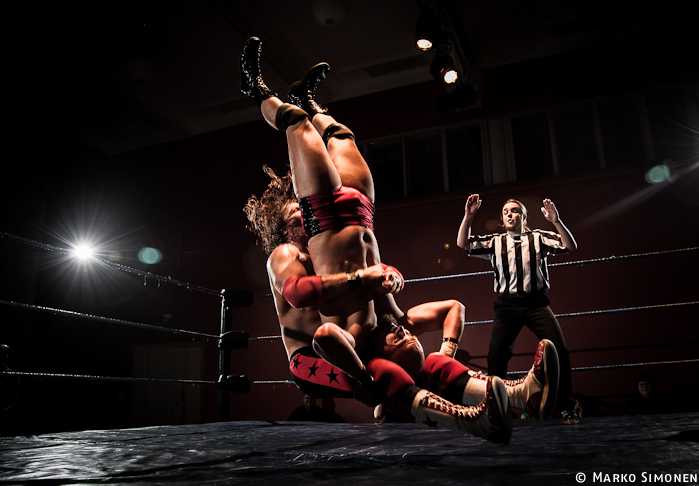 Since April of this year, a young, brash (albeit beligerant) wrestler by the name of Ricky Vendetta here in Finland has been boasting high and mighty about how he managed to pin a 3-time European wrestling champion in myself. Vendetta’s hunger to rise to the top in his chosen field cannot be slighted. I was once his age, in the same situation as he finds himself now: hungry and determined, willing to take any risk, regardless of its price tag, to achieve greatness. I’ve said it before and I’ll say it again: I’m actually honored. Honored to have this young doberman pup come after me, as the oldest dog in the yard, looking to take my mantle. I welcome his challenge, and I will take great personal pride in ripping him apart, as I re-establish to Ricky boy who exactly he has chosen to meddle with. The thing about young men is this: they become blinded by their ambition. Life has not yet taught them the hardest lessons of all. They are in the learning phase, the educational phase of what it takes to really be called a Man. During this rite of passage, from youth to full adulthood, a young man takes unwitting risks, the kind that will ultimately cost him dearly. I should know. At 41-years of age, I can look back on my own life and see these same lessons scattered about. In hindsight, I can clearly assess what each and every step cost me, what battle scars they left on my being in their wake. Ricky Vendetta has a world of talent. He has the kind of burning heart for the pro wrestling business that I have seen few exhibit here in Finland, where I am the founding father and pioneer of our grappling game. Over the past 11 years, all the way back to 2003, I can count on one hand the other Finnish contemporaries that have tunnelvisioned and set themselves to succeed and achieve like young Mr. Vendetta. That’s saying alot. I believe it becomes a literal obligation for mature men to pass down the life lessons that they have learned along this path of mortality to those who are following behind them. It’s called mentorship, and the lack of such in today’s self-serving society is all too obvious. All too many young men, and even grown men, don’t have a damn clue. They wander about aimlessly, not sure of their masculinity, their power, their calling or their talents. It’s sad, really. In this light, those who “have it” are morally obligated to pass it on and educate those who are still searching for their personal pot of gold, potential, or what have you. Ricky Vendetta is going to learn the hard way what it is like to earn your stripes in this game of life. That lesson will be afforded to him inside of our sacred squared circle, the testing ground of guts and intenstinal fortitude. It’s a place where men are broken, where boys find themselves missing their mothers. It’s a ruthless stage, where the wheat is mercilessly separated from the chaff. On September 13 in Helsinki at FCF Wrestling’s Syyskuun Selkäsauna event, Ricky Vendetta’s shallow boasts about going over not once, but twice, on the patriarch of Finnish professional wrestling, “The Rebel” StarBuck, will come to an abrupt end. I will not only punish young Ricky, as a father would his son, I will make him submit and scream for his life. This is a personal vendetta.